Yes, the 2016 Honda Accord gives drivers unbelievable engine power and awesome performance. Yes, the Honda Accord also provides you with a slew of safety devices and systems to keep everyone safe and sound on drives both long and short. But in addition to all of this, the 2016 Honda Accord is also outfitted with a bevy of technologies which promise to keep you and your passengers entertained and engaged no matter what. With Apple CarPlay, an AM/FM Radio Seek System, Steering-Wheel-Mounted Controls, Automatic Climate Control, and a Remote Trunk and Tailgate Release system, the new Accord promises to make your next drive as enjoyable, comfortable, and simple as possible. With Apple CarPlay, you and your passengers can plug your iPhones directly into your Accord, giving you instant access to a range of your own music, your own maps, your own apps, and much, much more. Meanwhile, if you want to dig into your old CD collection, you can rely on the audio system in the Accord to keep those old tracks pumping, even while you can also search for other music using its Radio Seek System. 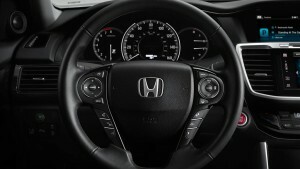 And you can do all this safely with the steering-wheel-mounted controls available in the Accord, which let you operate audio as well as a number of other functions without ever taking your hands off the wheel. Ensure that your next drive is as comfortable as possible with the Automatic Climate Control system in the Accord, which adjusts your cabin’s temperature depending on a number factors, keeping you cool in the summer and warm in the winter. 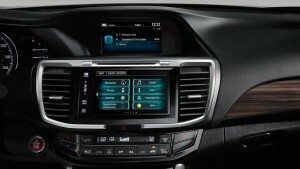 Finally, loading and unloading is made easy with the remote trunk and release system in the Accord. If you’re struggling under a burdensome armful of luggage, just activate the tailgate release first and then pack with no difficulty whatsoever. Take the Accord for a Test Drive Today! You can take the new Accord for a test drive and try out these new technology features for yourself simply by stopping by our David Hobbs Honda dealership at 6100 North Green Bay Ave in Glendale. Alternatively, feel free to give us a call at 888-216-8497 and we’ll give you lowdown on this exciting new vehicle. Don’t wait: experience the smartest in automotive technology today!